The Right Wing ‘Christians’ in Congress finally did it. They’ve cut $39 billion from the food stamp program. Where is the Church? Why have they not engaged the evil that is encompassing this new thinking within the Right Wing of the Congress? In a country with one of the worst income and wealth disparities in the world, do they really believe it is “fraud” and “abuse” and not circumstance that has most of those using the program on food stamps? The House approved legislation Thursday that would cut $39 billion in funds over the next decade for food stamp programs. Members approved H.R. 3102, the Nutrition Reform and Work Opportunity Act, in a close 217-210 vote. No Democrats voted for the bill, and 15 Republicans voted against GOP leaders. The bill would authorize food stamp programs for three years. The legislation, part of which was developed by Majority Leader Eric Cantor (R-Va.), passed in the face of fierce opposition from House Democrats, a White House veto threat, and warnings that it is already dead on arrival in the Democratic Senate. 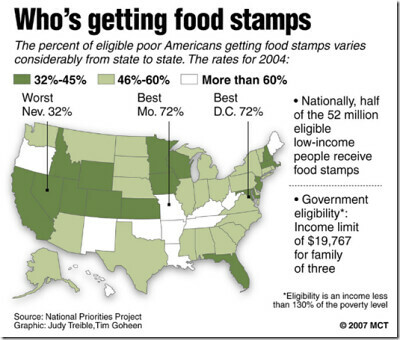 Many in the Republican Party have falsely claimed that food stamps create a welfare dependency. The problem with that analysis is that all parameters in the economy point to a middle class that is stressed. It points to a growing poor. It points to a system where wages are falling or at best stagnant. Gingrich even had the audacity to call the President the food stamp president. What is ironic is that all the Republican fears of creating a welfare state have been realized. Unfortunately, it is only the rich that benefits from the welfare they claim to have feared. After all, the House GOP didn’t hesitate to give Big Agriculture billions in unnecessary subsidies just a few months ago. The unnecessary purchase of military hardware is welfare for corporate shareholders. The privatization of government services transfers profits (and inefficiency when a government service is provided by a private entity for no reason) to the corporate shareholders. Even the food stamp program that feeds many is a boon for corporate shareholders as a percentage of food stamps provides ample profits. Sadly, this is pure evil. Because Republican policies have not been excoriated with the appropriate graphic words, they continue to push the envelope. Criminals have been heard to say that their first murder was difficult. As they continued with their murders it became easier. The Right Wing Republican analogy cannot be missed.